We are set to begin the second period of the #BorderBattle finale! #Gophers lead 2-0 after goals from Pitlick and Nroman. Gophers lead the Badgers 2-0 as the second period starts. Badgers and Gophers back out for the second period. UW down 2-0. Reilly tries to find Norman for his second of the night but the puck bounces over her stick. Just over three gone in the second. Three minutes gone by in the second period and the Badgers still find themselves down 2-0. #Gophers will have their first PK of the night as Collins is called for holding. Minnesota's Collins goes off for holding UW's Kunin. Badgers get their first power play, trailing 2-0 with 15:51 left in the second. Badgers will have their first power play of the night with 15:51 on the clock as Minnesota is called for holding. BADGERS GOAL: Luke Kunin scores from the slot just after the Gophers fire wide on a 2-on-1, and Minnesota's lead is 2-1. 14:42 left 2nd. Goal, Wisconsin. Kunin narrows the #Gophers lead to one as he puts the Badgers on the board. #Gophers will have a PP of their own as Tischke earns his second penalty of the night. This time for high sticking. Media timeout. UW heads back on the PK as Tischke is whistled for high sticking with 14:15 left in the second. UW's Tischke goes off for high-sticking with 14:15 left in the second. Gophers on their third power play (1-for-2). 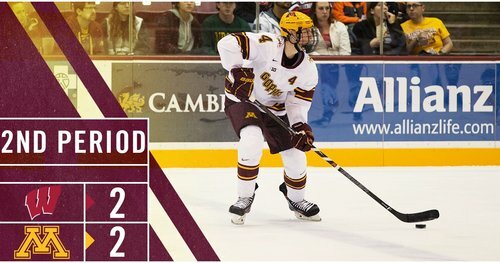 Luke Kunin's goal was his 20th of the season. He's the 21st UW player to score 20+ in last 30 seasons, 7th in first two seasons with team. Tischke out of the box and teams are back to full strength! Icing called on Wisconsin with 11:15 to play in the second period. SOG currently 18-9, #Gophers . #Gophers will go back on the PK as Lindgren is given two minutes for tripping. Minnesota's Lindgren gets called for tripping Zimmer. Badgers on their 2nd power play (1-for-1) w/ 10:55 left in the second, trailing 2-1. UW getting another man advantage as Minnesota is called for tripping with 10:55 left in the second. Badgers come up empty on the power play. They still trail 2-1 with 8:55 to go in the period. 7:45 left in the second. Minnesota leads UW 2-1. Media timeout with 7:45 remaining in the second period. #Gophers lead 2-1. 4:35 to go in the second and the Badgers are still searching for the tying goal. 2-1 Minnesota. Media timeout with 4:12 to play in the second. #Gophers leading 2-1, have the edge in shots 19-13. Schierhorn flashes the leather and makes a nice glove save. 2:26 to play in the second. #Gophers will finish the second period on the PK as Bischoff is called for interference. 1:26 remaining. Bischoff is called for interference on Kunin in the neutral zone. Badgers power play with 1:26 left in the second, trailing 2-1. UW headed back on the power play as Kunin draws an interference call with 1:26 to go in the period. One minute remaining in the second period! 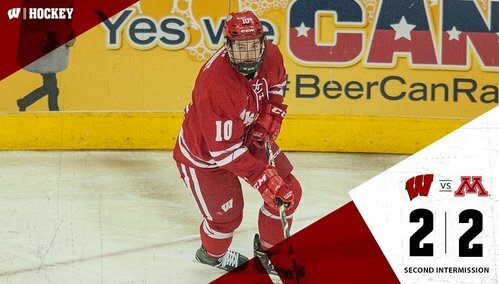 BADGERS GOAL: Jake Linhart scores from the right point on the power play with 15.8 left. 2-2. PPG, Wisconsin. Linhart gets one through from the point and we are tied at two. END 2: Wisconsin and Minnesota are tied 2-2 after second-period power-play goals by UW's Kunin and Linhart. SOG 11-6 UW in the second. Badgers and Gophers are tied 2-2 as the third period starts. The third period is a go from Mariucci! #Gophers looking to get back on top after a scoreless second.